The “Blessing of the Bicycles” is in that sweet spot of my life, mixing my attempts at sustainable transportation, my practice of community outreach and my tendency to want to make everything a ‘spiritual discipline,’ even bicycles. This is third or fourth year that Hope Central Church has blessed our bicycles, and the second year that we’ve partnered with First Baptist Church in Jamaica Plain and the Boston Cyclists Union. If you are in Boston, join us Sunday May 13 from 1-5pm with free bike repairs at 1st Baptist JP- 633 Centre St, and a bike blessing at 5:30pm at Hope Central JP 87 Seaverns Ave. Special thanks to Equal Exchange for donating Fair Trade Bananas that we handed out to cyclists with our flier attached, and Bike Safe Boston, for sharing the Cyclist’s Bill of Rights and Accident Report that we’ll hand out. And many thanks to House for All Saints and Sinners, Denver CO for the liturgy that we adapted to Boston. Join us. Let us pray: Present in a world groaning under the excesses of consumption we acknowledge the inherent goodness of non-motorized human powered transportation and give thanks for the simple beauty of the bicycle. God of life, Hear our prayer. Present in our community filled with children and adults, we pray for those learning to ride. Keep them smart, safe and visible on our neighborhood roads. God of life, Hear our prayer. Present in a community filled with strife we pray for the victims of road rage and bike theft. We ask for the strength to forgive mean people. Forgive our impatience. God of life, Hear our prayer. Present in a world of work we pray for those who build, repair and clean our bikes and those who rely on bicycles to earn their living. 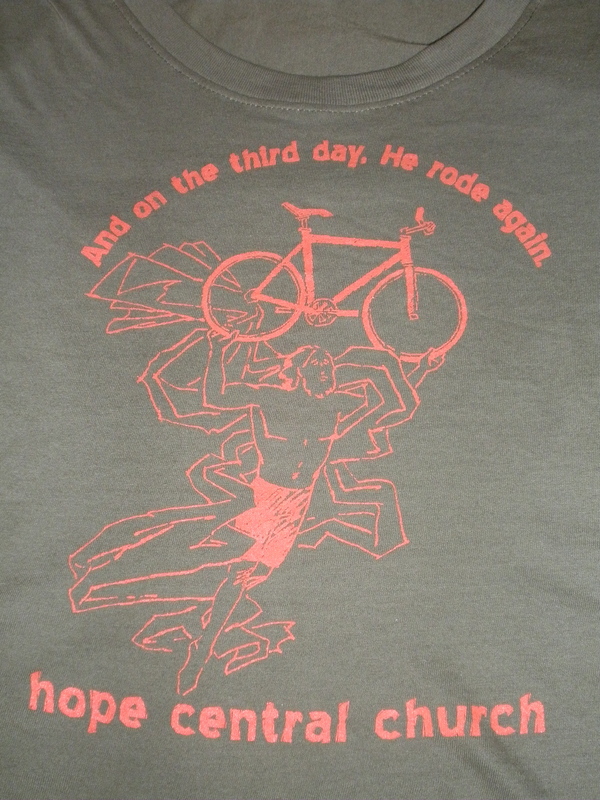 Bless the Boston Cyclists Union and all who advocate for a more just and sustainable future. Bless those who choose to not drive to work and those for whom driving isn’t even an option. God of life, Hear our prayer. Present in a community of beautiful diversity, we ask your protection and blessing on all who ride: pedi cabbies & weekend warriors; athletes & messengers, homeless folks & eco-warriors, old & young, biking believers & questioners and all the others who take to the Boston streets, paths, parks and hills. Keep us safe as we ride. God of life, Hear our prayer. God, bless these our bikes. Let all who ride be like flashes of lightening. Pour out your protection on our helmets. Take our handlebars and steer us ever true. Bless our wheels that move upon your good Creation. Anoint our brakes that we may know our limits. Fix our seat that whenever we roam, we might always return safely. Send down your Spirit with a blessing upon these bikes, that fortified by the might of your heavenly protection, these bikes may be help and aid unto all who make use of them. May our wheels rise. We send up glory, both now and ever, and to the ages of ages. Amen. this is awesome 🙂 ride on!